One of a handful of full-block apartment buildings in the city with major garden courtyards, the Belnord was designed by H. Hobart Weekes and completed in 1908. 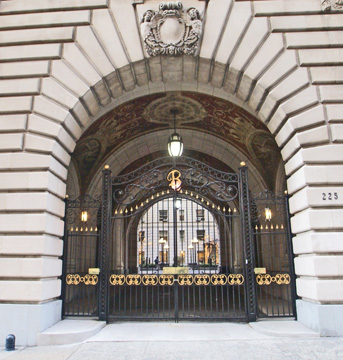 The Renaissance Revival-style, rental building has two very imposing and large arched entrances on 86th Street that lead to a very large, landscaped courtyard with a large and handsome fountain. 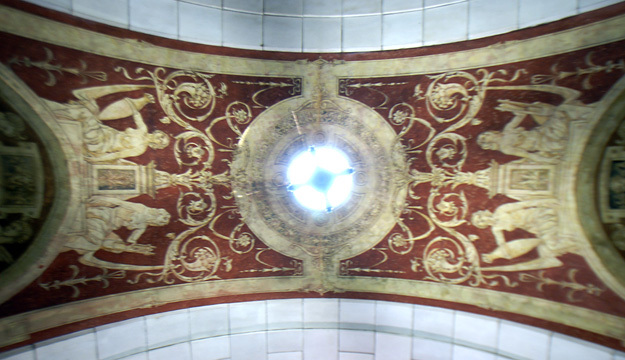 It was designed so that carriages could drive around the entire courtyard, which has canopied entrances at the four angled corners. The 22,000-square-foot courtyard is actually more interesting than the exterior because of its immense sale and different façade treatment. The facades are entirely rusticated except for double stacks of bay windows in the center of the east and west walls and two single columns of bay windows on both the north and south facades that also have one column of high windows in their centers. The original planting was encircled by attractive four-globe light-posts and was quite formal and to the modern eye evocative to a certain extent of the black-and-white photographs of the gardens in Alain Renais's film, "Last Year at Marienbad." Indeed, this is almost a de Chiricoesque vista as the tall, textured walls encompassing the space offer both security and imprisonment, awe and ire, dream and reality. There is no hard-and-fast rule about such courtyards. Depending on their scale and treatment and site, they can be neighborly, invasive, inspiring, or industrial. Only a lack of imagination precludes finding exciting ways to make them inviting and sensational for they are great spaces. In their wonderful book, "The A. I. A. Guide to New York City, Third Edition," (Harcourt Brace Jovanovich, 1988), Elliot Willensky and Norval White, described the Belnord as "Brilliant, but boring." 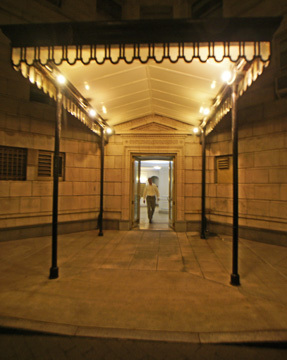 Another major courtyard building, the Apthorp, which occupies the full block between Broadway and West End Avenue and 78th and 79th Streets, was erected the same year. 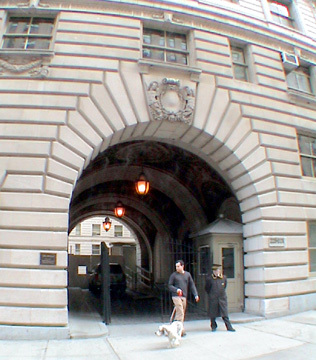 Another major courtyard building in the vicinity is the Astor Court on the east side of Broadway between 89th and 90th Streets, but it occupies less than a half that big block. In 1999, this impressive building, which has a three-story, rusticated limestone base, rusticated quoins enclosing one stack of windows and a large cornice, was cleaned. The façade has three bandcourses with escutcheons on the fifth floor and swags on the 11th and 12th floors at the corners. The 13th floor has handsome decorative rectangles beneath the cornice. The east and west facades are nicely proportioned and quite grand, but the south and north facades, which have an asymmetrical sprinkling of very small windows amid the otherwise symmetrical fenestration, are very long and merely imposing. The windows on the sixth through the 12th floors have slightly arched tops, which is an interesting touch. The building has no balconies, no garage and no sundeck. There is a subway station at Broadway and there is excellent cross-town bus service on 86th Street. 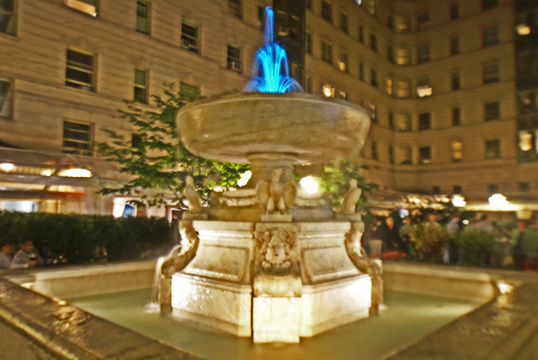 This neighborhood abounds in good shopping and restaurants and public transportation. Riverside Park is a couple of blocks to the west and Central Park is a couple of longer blocks to the east. Its residents over the years have included Zero Mostel, the actor, Isaac Bashevis Singer, the writer, and Art D'Lugoff and for many years it was owned by Lillian Seril beforeit was acquired by Extell Development. In his "Streetscapes" column May 3, 1992 in The New York Times, Christopher Gray noted that when it was built the 175-unit building was "promoted as the largest multiple dwelling the world" and "apartments ranged from 8 to 14 rooms, with rents of $175 to $500 a month, high for the period." 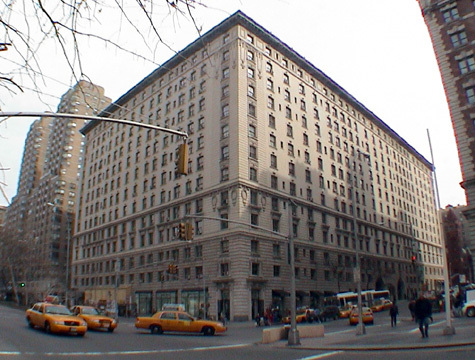 An article by Teru Karush Rogers in the November 5, 2006 edition of The New York Times noted some of the building's three- to six-bedroom apartments "rent for $10,000 to $40,000 a month," adding that Extell has "converted a large chunk of ground-floor space into a daytime playroom in which the toys can be stowed behind cabinetry and the room transformed into an area for adult use." In Mr. Gray's 1992 article, he quoted an article from The Record & Guide that said it was delightful "to be able to step from the library in a smoking jacket and drop a letter into the chute running down through the semi-private vestibules." Mr. Gray also noted that "Especially unusual was a vast, subsurface courtyard strictly for delivery trucks, entered from 87th Street," adding that an early advertisement for the building said that its courtard plan "eliminated for all time undesirable elements and the possible of intrusion." 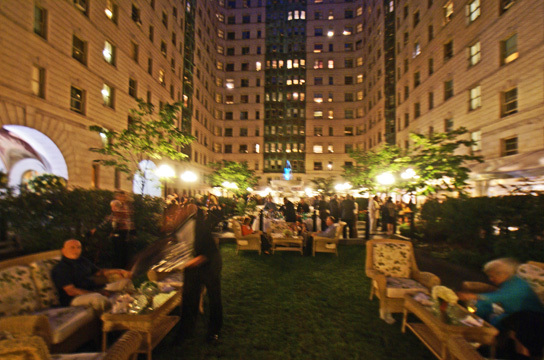 On September 17, 2008, Extell Development Company gave a centennial party for the building in its enormous courtyard. 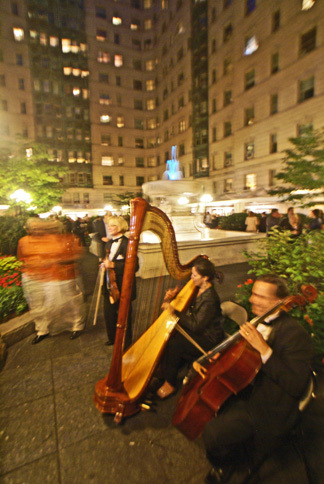 The party featured several musicians in black-tie, many hors-d'oeuvres and two sushi bars and a continuous tent that surrounded two-thirds of the courtyard. The party was given by Gary Barnett, the president of Extell, who acquired the building in 1994.